The Mobility Store is a respected national supplier of mobility aids with a total of 20 years of experience we have gained a reputation for knowledge and expertise in the specialist mobility arena. We stock a comprehensive product portfolio peppered with top brand names to assist people with the practicalities of everyday life and comfort. Our customer service offers expert help and advice to guide you through the secure online shopping process. We are a friendly, helpful, dedicated team who thrive on supplying the best products and services to our clients. 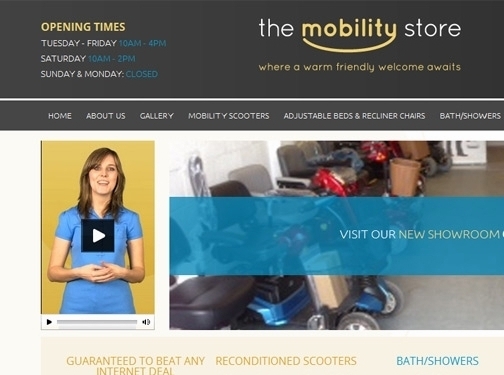 Rest assured The Mobility Store will have the correct mobility product for you whether is be a mobility scooter, a recliner chair or just simply a walking stick. We also supply three or four wheeled walker, wheelchairs and we are able to install stair lifts. Here at The Mobility Store we pride ourselves on the relationships we develop with both our customers and suppliers. Our experienced team of staff are here to help! UK (Aylesbury, Buckinghamshire) based business providing a range of mobility products and related services. Website includes product catalogue, news section, details of business premises, full contact details.